I like to think of myself as an all around collector. I love things that have once been owned by others or things that create a sense of nostalgia. So I find my self just collecting old things with out a specific theme. While contemplating my collections, I decided to look deeper into my gnome collection. I don't have too many but I have two distinct collections. Well, I guess you could say three if you count my senior thesis. I adore gnomes. I love them so much I made them the center of my senior thesis project for my BFA. I love them so much that I collect them when I can not resist them. I get it from my grandmother, whose house & garden is filled with them. One of my favorite movies is Gnomeo & Juliet. I mean really, just the name is sooo cute. When I saw it, I made that little face you make when you see cute babies pretty much the whole time. The first collection of gnomes are my Chrome Gnomes. First let me say that Zach does not approve of them. Secondly let me say that sometimes I don't really care! These are my two favorite gnomes & the only gold two. The one on the right was purchased at Christmas Town in Busch Gardens. Every year, Busch Gardens Williamsburg puts on a Christmas spectacular. 5 million lights lit a portion of the park up from 2 million the year before. I don't think these were put out just for Christmas though as there were chrome gnomes of all colors. The one on the left was purchased as a white piece of ceramic. I believe it was part of bisqueware like in those paint your own pottery shops. I painted it with gold craft paint & glitter. 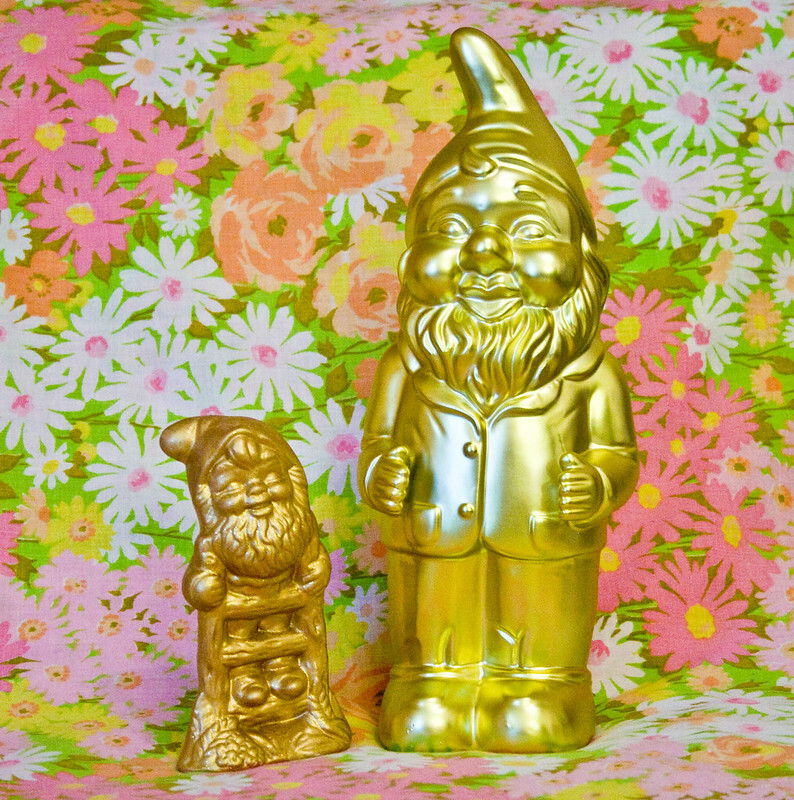 This was the first gold gnome I owned. I'd like to find more gold or chrome gnomes to continue on in this specific niche of gnome collecting if you will. They stare at guests using the downstairs bathroom. It's pretty funny. Right now they are both on the side of the room opposite the toilet. I should move one to just above the toilet so ladies & gents a like will get a stare down they are aware of. I don't particularly care for the traditional gnome but rather a modern interpretation. I think the things we collect reflect a lot about us. To me, collecting things means we want to identify ourselves a certain way & unite ourselves with others who collect the same things or share those same identities. Yearning for nostalgia but presenting it in a modern or unique way allows us to identify our shared experiences. Peep my artist statement if you'd like to know more about how I feel on identity. Do you find yourself collecting sub-categories? What are your thoughts on collections & identity? this is an awesome collection. my husband and i (when we lived in our home, prior to moving) had garden gnomes, and we have since agreed to collect more so that when we live in what we refer to as 'our real home' we can have gnomes instead of plants. like tons of them. 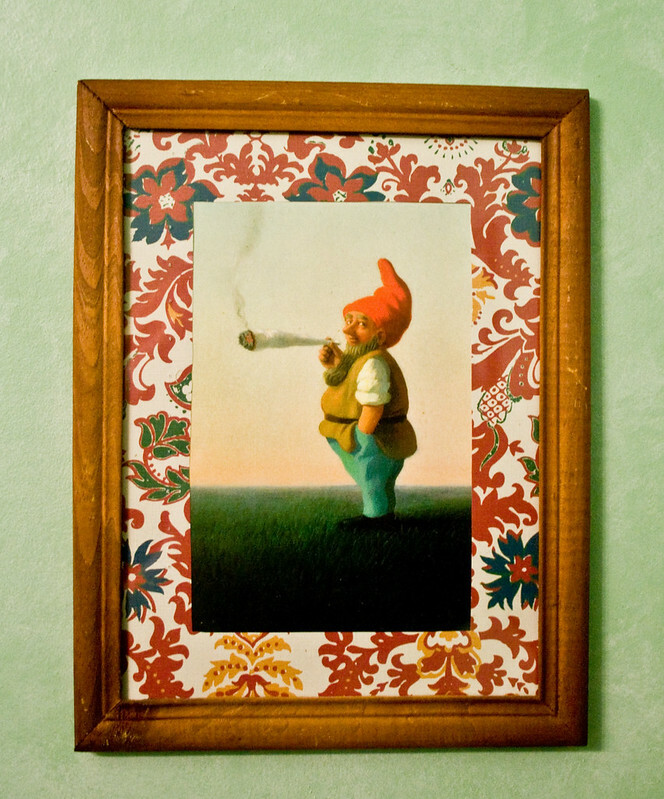 i love those gold ones - and that smoking gnome is so random and hilarious!